When Mark Parker and his team created the TREWGrip Mobile Dock, a mobile keyboard featuring a "rear typing" design, his goal was come to the aid of the large number of professionals, specifically those in the healthcare field, who spend the workday on their feet. He was unaware that many of those same healthcare professionals would recommend his product to their patients. "Most of (TREWGrip's) early traction has come from the assistive technology industry and occupational health and safety professionals," Parker says. "Quite honestly, we didn’t think about the health benefits when designing TREWGrip, but there’s something called the 'functional position,' which is the ideal position of the hands/wrists. TREWGrip’s design allows for this ideal hand/wrist position when typing." TREWGrip LLC is a spin-off of Parker's umbrella company, Outlier Technologies, headquartered in the Blue Ash area. 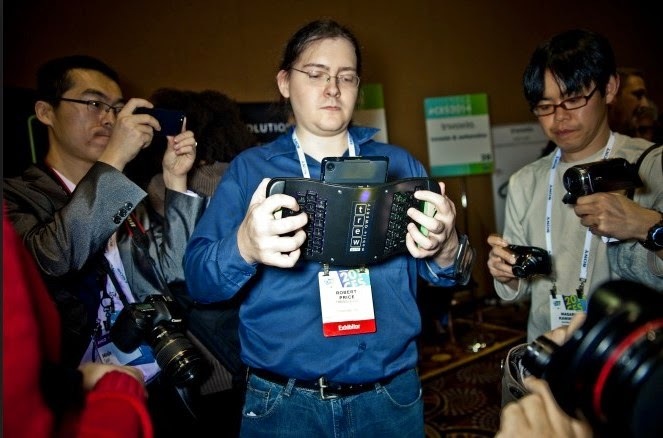 The Mobile Dock's rear typing-enabled design requires the user to hold the device much like an accordion, allowing someone to type with both hands without using a surface (or your other hand) for support. The product's multi-faceted health benefits brought TREWGrip to the Health Information and Management Systems Society (HIMSS) conference last month in Chicago. 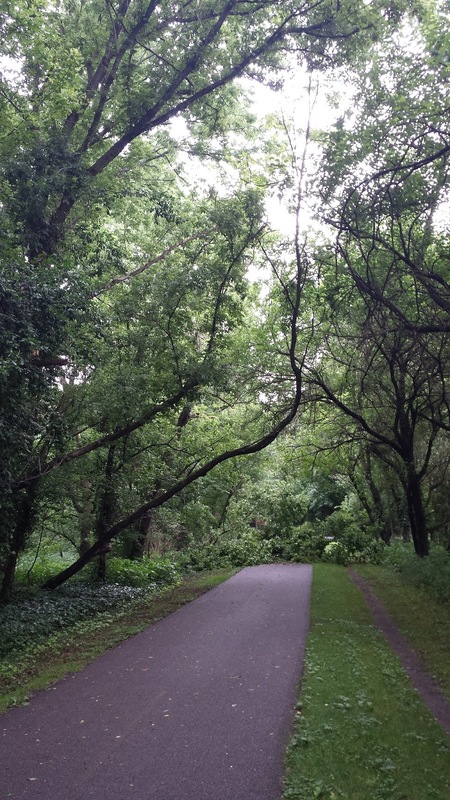 Parker's experience at the conference proved that the healthcare market is ripe for change. "A lot of the interfaces being used right now are pretty outdated," he says. "Companies have certain systems in place because there aren't other hardware platforms out there — they have very little incentive to upgrade." According to Parker, doctors and hospitals have yet to embrace new technologies like the tablet over the laptop due to the fact that they don't truly transform their working experience. TREWGrip, on the other hand, does what tablets and laptops can't — it eliminates the need for a stationary workplace. "Approximately 1.3 billion people around the world are considered 'mobile workers' and often find themselves sitting on the floor to get their work done," Parker says. "So if you want to understand what inspired TREWGrip, stand up in your office and try typing this story while holding your laptop or your desktop keyboard." 10 are Better Than One: Will Healthcare Believe the Math? 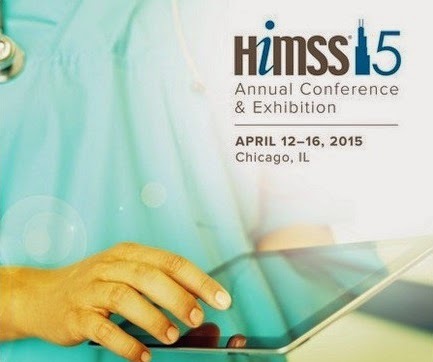 On the homepage of HIMSS.org is the following image. For some, it’s an illustration of innovation that’s making its way into healthcare. For others it’s a discussion point about whether mobile technology, in its current form, makes sense for busy clinicians, medical scribes and other health care professionals. Literally, it shows a doctor using a single finger to manipulate a tablet. Perhaps all he needs is a single finger to navigate an app, but as many industries have already figured out, when it comes to getting real work done, 10 fingers are always better than one. A 2014 headline reads, “Tablets: Not mobile enough or productive enough for many professionals.” The author suggested that one of the main reasons why is because of the lack of a physical keyboard. Here we are in 2015, and not much has changed. Hospitals and medical practices across the country are investing in mobile technology, using it for a variety of administrative tasks such as accessing patient records, scheduling patient appointments and checking patients in and out. Early concerns included security and data integration, but as these concerns have been overcome, the one challenge that continues to linger is the user experience. Checking records, swiping from screen to screen and selecting from menu options are easy to do, but when it comes to data entry, tablets fall short because of the lack of a keyboard. We know that productivity matters to healthcare providers and doctors. However, in this era of electronic healthcare records, there has been a significant increase in documentation, something doctors simply don’t have time to do. Doctors want to focus on providing quality patient care and maximizing their time and skills, not typing on a computer. This demand for documentation has sparked the emergence of the medical scribe industry, which currently boasts 22 companies supporting physicians in 44 states. The American College of Medical Scribe Specialists estimates that there will be 100,000 scribes by 2020, more than five times the number today. The laptop, which many scribes carry around with them, has long been considered the best productivity tool for the mobile worker. 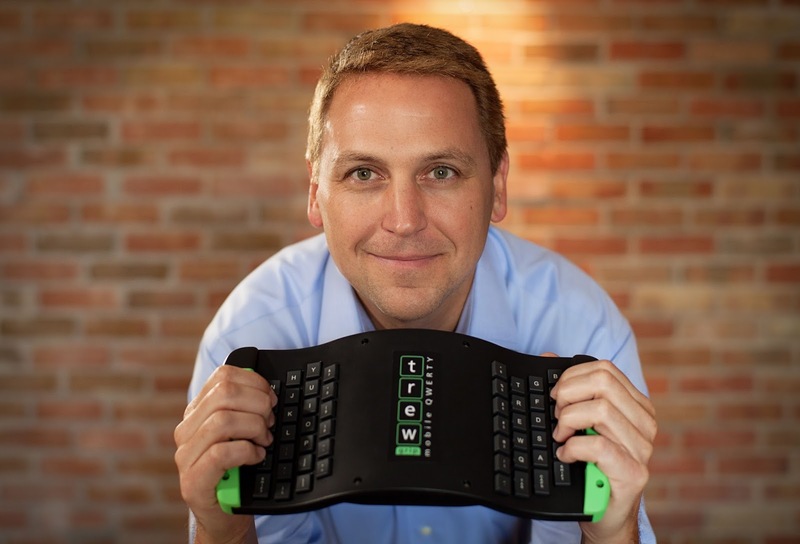 It allows users to take the full keyboard with them so that they can type productively from wherever they are working. Unfortunately, the laptop is not a mobile solution. The user still has to sit down and set-up to actually be productive with it. In addition, many medical offices were not designed to have extra carts and people in the examination rooms, leaving medical scribes to stand and type with one finger on their laptops or find any available space to perform data entry. When the tablet was introduced five years ago, many touted it as the quintessential tool for mobile workers. It’s clear by the image above that many healthcare professionals would agree. But the lack of a physical keyboard has reduced data entry to hunt-and-peck typing with one or two fingers, and resulted in people generally using tablets for data consumption, not for getting work done. The global proliferation of tablets and smartphones has created a peripheral market that is attempting to solve this productivity challenge by introducing add-on “portable” keyboards and alternative text entry apps. It has also created hybrid devices called two-in-ones, which provide an either/or solution to the productivity challenge. While typing on tablets has improved, the current devices only allow mobile workers to be mobile or productive, not both. The answer to this mobile productivity challenge lies somewhere in between laptops and tablets, and it still includes a physical keyboard. It’s the reason why TREWGrip introduced the TREWGrip Mobile Dock, a handheld keyboard and air mouse for today’s mobile technology, smart TVs and desktop computers. 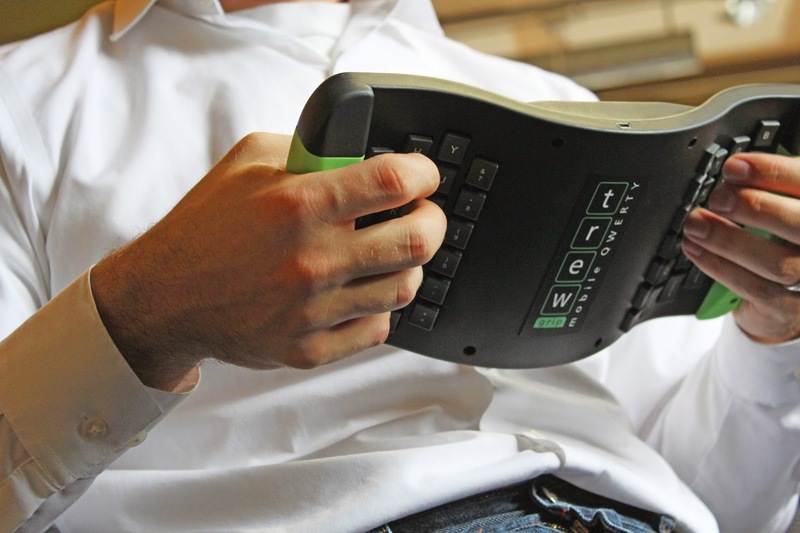 The ubiquitous QWERTY keyboard is split and rotated so clinicians and medical scribes can hold TREWGrip and perform 10-finger text entry in any environment while using a variety of technology platforms. The demand for more documentation of patient information, and managing patient orders, requires more than a click, a swipe or a tap. Doctors know it, and as a result, many have backed away from the computer and brought in medical scribes who are using portable solutions in environments that demand mobility. Healthcare professionals need technology that provides convenience and flexibility, allowing them to be effective and productive standing up, sitting down or moving from the examination room to the office. Most importantly, they need to be able to use both hands, because ultimately 10 fingers is the secret to getting real work done. During our Kickstarter campaign, many of you provided feedback on the price of TREWGrip. Despite our attempts to explain our manufacturing challenges during the campaign, price was clearly a deterrent for most. After making the decision to keep TREWGrip moving forward, our first priority was to reduce the production costs. Having already completed three rounds of design and engineering, and having an almost production ready unit in hand, I have to admit it was difficult going back to square one. The biggest challenge we faced with the redesign was how to reduce the cost without sacrificing quality. But I have to say, the Team knocked it out of the park! In addition to reducing the production costs, every unit will now include a built-in accelerometer and gyroscope to control on-screen mouse movement. This was an additional option with the previous build, but by reengineering the switches and standardizing on one circuit board configuration, we were able to include more features at a reduced cost. So we’ve done our part --- now it’s up to you. The MSRP for TREWGrip, with built-in accelerometer and gyroscope, will be $249US when we launch this Fall. But we are offering an exclusive discount opportunity to those of you who pre-order and help us promote TREWGrip between now and then. It’s called “Crowd Discounting” and here’s how it works. Pre-order TREWGrip on PreLaunch.com and help us get others to do the same. Credit cards will not be charged until the end of the pre-order campaign; but when we reach our first unit sales target, everyone’s price drops to $199US. And when we hit our second, it drops to $149US. Please visit our campaign on PreLaunch.com for details. For those of you supported our Kickstarter campaign, thank you again for your support. We hope you appreciate all our hard work, and will support us again on PreLaunch. And for those of you who didn’t support us because of price, here’s your chance to get TREWGrip for as low as $149US. There's a very interesting trend occurring with headphones these days. After years of seeing the technology get smaller, more and more people are opting for larger headphones over earbuds. At first it seems counter intuitive; why would someone choose to carry a bulky set of headphones over a compact set of earbuds, especially when traveling on an airplane? But in reality, headphones are just more comfortable and offer a better sound experience. There are some who say TREWGrip will never catch on because it is too big and bulky, and needs to be small enough to fit into a shirt or coat pocket. 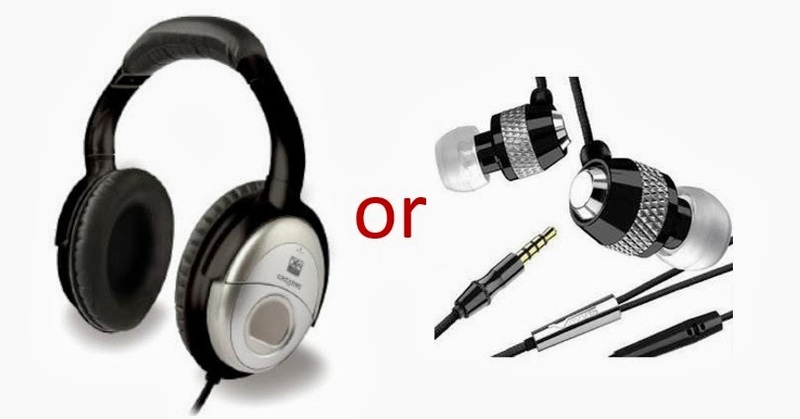 So we ask... Would you rather spend your day listening to music with headphones or earbuds? And, would you rather spend your day pecking with two fingers, or typing on a keyboard? It’s hard to believe that it has been over a month since TREWGrip made its international debut at CES. I want to thank everyone who supported our efforts and helped us promote TREWGrip. 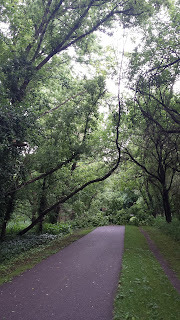 I also want to thank those of you who have recently begun following and sharing TREWGrip on social media. We are gaining significant traction, and beginning to make an impact in the consumer electronics industry. During CES, quite a few interesting articles were written by a variety of media outlets, and there were also quite a few interesting comments posted online. With any attempt at innovation or disruptive technology, there are always the naysayers and the skeptics --- comes with the territory. But there are also those people who catch my attention by providing insightful feedback --- these are the people who help me see TREWGrip from a different perspective. As a kid, I remember vividly the challenges associated with getting catsup out of a glass bottle. When I opened a new bottle, it was almost impossible to get the catsup flowing, and there were several tricks that I would use to overcome this problem. The first wasn't really a trick, rather the use of brute force by pounding on the bottom of the bottle with the palm of my hand. This approach typically resulted in catsup spatter all over my burger or hotdog, and sometimes an embarrassing stain on my pants (but that’s a story for another post). A more sophisticated approach involved sticking a knife in the end of the bottle to get the catsup flowing. Although admittedly a bit more civilized than brute force, for some reason people would always ask me if I wanted a hotdog with my catsup --- I think it had something to do with the amount of catsup on my hotdog. Now there was one trick that some people would use that required a bit of skill. And the people who mastered this trick would always try to coach people who used another method. The trick was to tilt the bottle at just the right angle as though you were pouring it, and then tap the 57 with the palm of your hand. As the catsup began to flow, you would have to adjust the angle of the bottle and your tapping force to control the flow of catsup. Or at least that was how I was coached to do it. Can't say I ever really mastered it. Once a bottle was opened and catsup flowed for the first time, pouring seemed a bit easier, especially when the catsup was kept at room temperature. 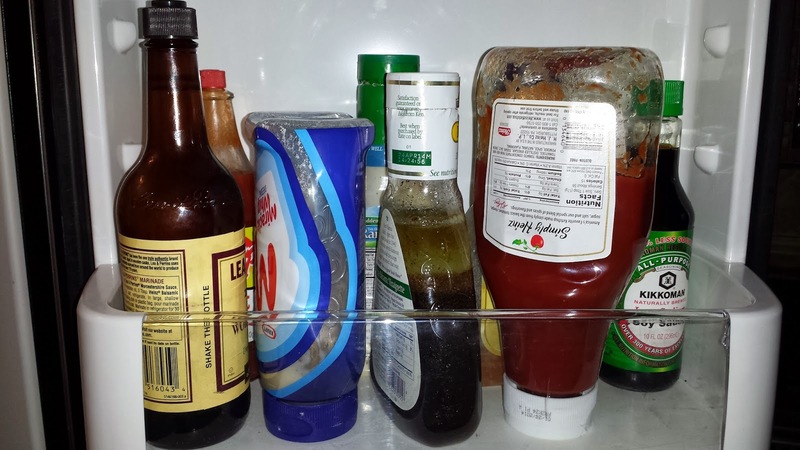 There were still times, however, especially if the bottle was stored in the refrigerator, when I would have to violently shake the bottle up and down until the catsup came out. And don’t even get me started on a bottle that was almost finished. Most times, I would turn the bottle upside down and lean it against something until the catsup followed down into the cap; resulting in a crusty cap full of catsup. Then one day someone in the catsup industry invented a new type of bottle; a squeeze bottle with an oversized cap. Now there were squeeze bottles with pointy tops that were mainly used in restaurants, but this new bottle was different --- it was designed to be stored upside down. Nowadays when people see catsup bottles with oversized caps, or “upside down” catsup bottles… well, it just seems to make sense. So my question is --- who decides what’s “right side up” and what’s “upside down?” Or, is something considered upside down simply because another way is just the way it’s always been? We didn’t design TREWGrip as an upside down keyboard. We did it because it just makes sense!